Despite the controversy that sometimes surrounds them, every once in awhile a project funded by online crowd sourcing comes along that seems too brilliant to ignore. Thanks to the donations of Who fans around the world, Robert Doyle and his daughter Alex, both Florida residents, will be able to launch a TARDIS into orbit. So far, the pair have raised over $42,000, soaring past their set goal of $33,000 (£22,000), an amount that may increase even more between now and the campaign's closing at the end of the month. Robert and Alex, both life long Doctor Who fans, wanted to find the perfect way to celebrate the show's 50th Anniversary. While the money raised probably won't be enough to fund research into transdimenional engineering, the father-daughter duo did manage to raise more than their original goal. This has allowed them to make some additions to their original plans. "Now that we have exceeded our budget, we can do other things that we wouldn't have been able to do otherwise-make a bigger TARDIS, put a camera on the outside for 'selfies' and so on," Robert said. According to the Kickstarter page, the TARDIS will be rocketed off into what is called "low Earth orbit." This is defined as an orbit around the Earth below approximately 2,000 kilometres (1,200 mi). 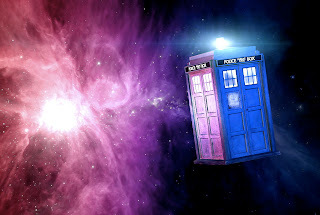 In this orbit, the homemade TARDIS will be floating around our planet alongside the International Space Station and many of Earth's artificial satellites. If you're interested in finding out more about the project, Robert and Alex's Kickstarter page can be found here.